SpinZip is a portable application for Windows that allows you to create ZIP files in three unique ways; User Specified Size, Specified Number of Files per ZIP, and One file per ZIP (auto-named). The application is developed for users who often need to send ZIP files via mail, and require selecting files manually from the source to prevent exceeding email attachment size limit. It can also come handy in situations where one wants to compress a large number of files without having to select them from multiple locations. SpinZip lets you choose both source and target locations to create ZIP archives for specified files. Using the ZIP size limit feature, you can quickly send the files via email to others without having to worry about the attachment size limit. It lets you create ZIP archives with either a specified number of files or a defined archive size. All you have to do is enter the source directory, the output directory, specify the Output mode, and click Generate. Extra options allow you to set compression level for the files on a scale of 0-9, apply filters for leaving out specific files from compression and applying a password to the ZIP archives. 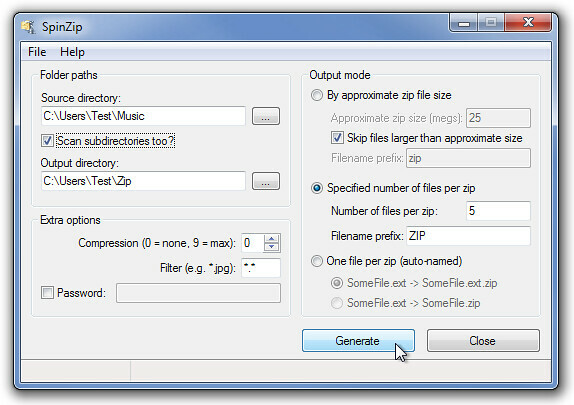 The Output Mode has 3 options, including By approximate zip file size, Specified number of files per zip, and One file per zip (Auto-named). You can also specify the Filename Prefix before creating an archive. During testing, we used the application to make archives of 5 files. If you want the application to work flawlessly, make sure that all your files are stored in the root directory of your source folder. If there are a lot of subfolders for the application to scan, it can get a bit confusing as it takes a specified number of files that are to be archived from the parent folder, and then moves to subfolders. SpinZip has a memory foot print of less than 1 MB and works on Windows XP, Windows Vista and Windows 7. 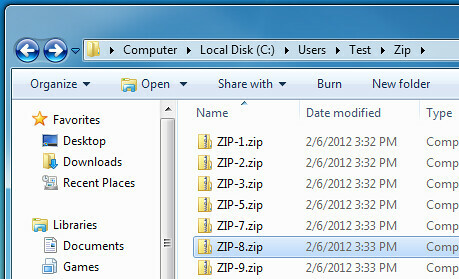 No Comment to " Windows: SpinZip Create ZIP Files With Custom File Count Or Archive Size "